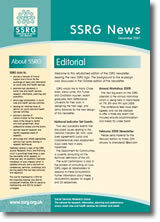 Every issue of the SSRG Newsletter is available in full in the Members Area. The content listings for the most recent editions are available below, with a selection of articles available in full. Click here to join SSRG.